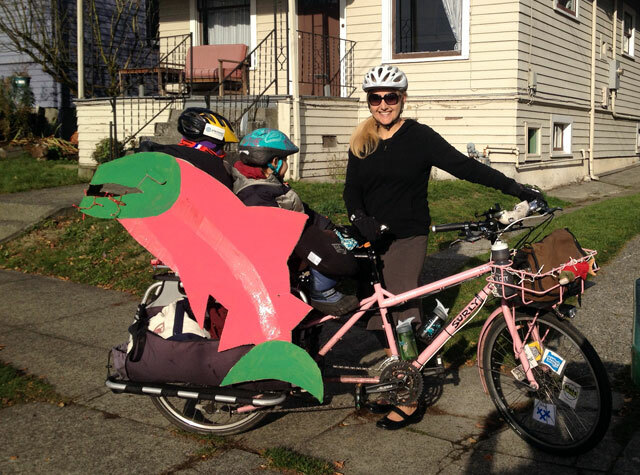 I’ve only dressed my bike up once, as a salmon for 2013 Cranksgiving. 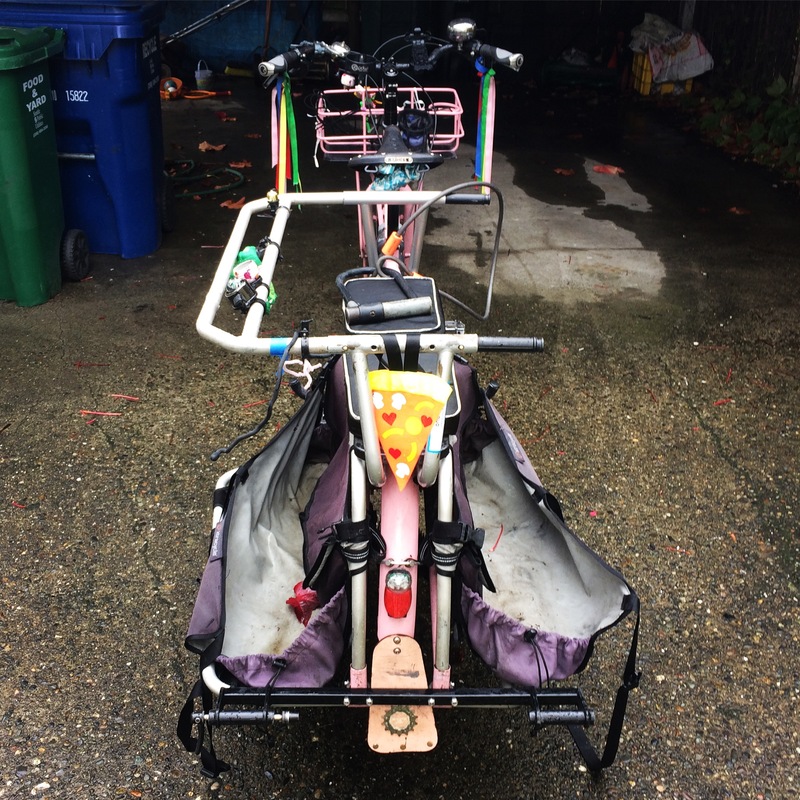 I’m all for dressing up bikes and can’t wait to see the entrants in the Xtracycle #XtraSpookyContest, but my days of bike decorating are done for now. 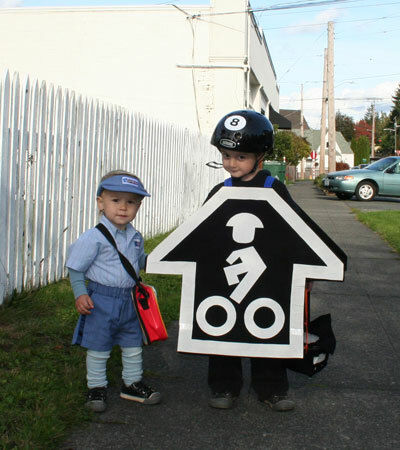 I’ve had THE BEST bike costume idea for three years, but it keeps raining on Halloween and I think it’s time to officially give up the dream…and share it here for closure: UPS truck and driver. I haven’t yet recycled the cardboard and donated the outfit pieces back to the thrift store, but that will happen soon. I’ll keep my two yellow Go Brightz–they were to be my flashing hazard lights for when I parked in bike lanes and made my deliveries. I finally took them out of their packaging to have down low glow on my road bike for the May Moonlight Mash in Eugene, Oregon this year. 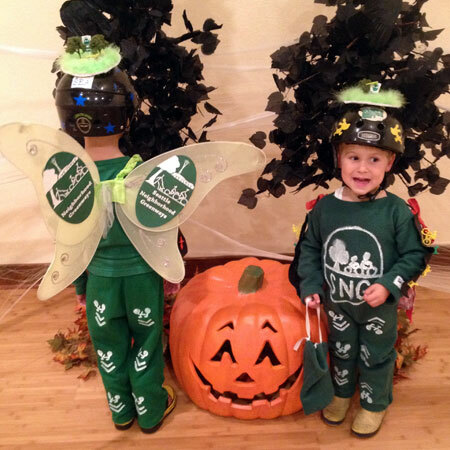 Are you dressing up your bike or dressing up as something bike-themed this year? I finally named my cargo bike! I have a lot of friends who name their bikes and I’ve always thought that was a fine idea, but I’m just not nearly as creative as I used to be, so I’ve been content with The Old Mamabike, The Mamabike, and The Tandem. 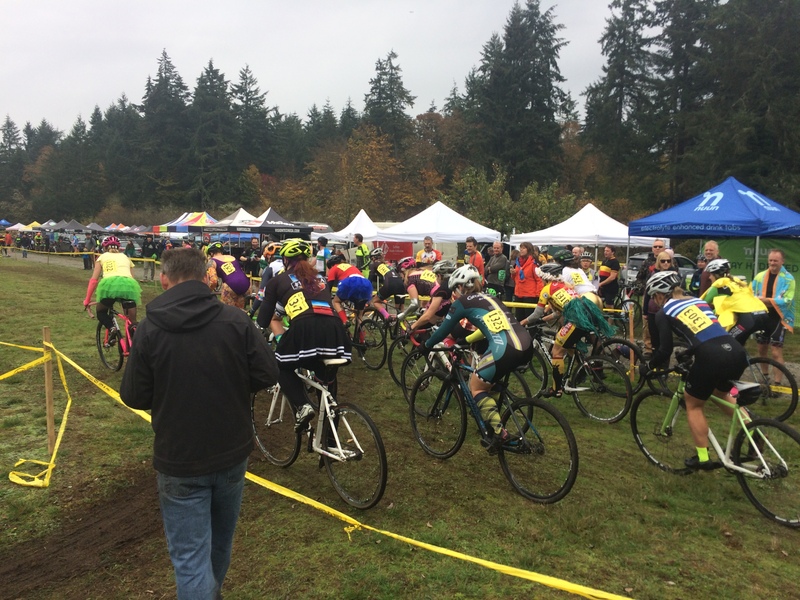 However, I did name my most recent bike–Valentine, a single-speed cyclocross bike I got in February. I figured it was a fluke, but now…maybe there’s a chance I’ve still got it! Oh, fun side story: my parents opted not to use our given names for my brother and me for the first two years of our lives. I can’t remember which culture if was from, but I remember it was borrowed from a culture not our own. I also remember my mom responding to my “BUT WHY WOULD YOU DO THIS TO US???!! !” with “Well, we heard about this tradition and I can’t remember the reasoning behind it, but it sounded neat!” Sheesh. (I’ll post an update if my dad emails me to clarify.) Anyhow, my brother was introduced to me as Little Brother, but I was a bit under two (ooh, and nameless also, I guess!) when he was born and the closest I could get was Yakoo Brooker. And so everyone called him Yakoo Brooker, Brooker for short. For a long, long time. 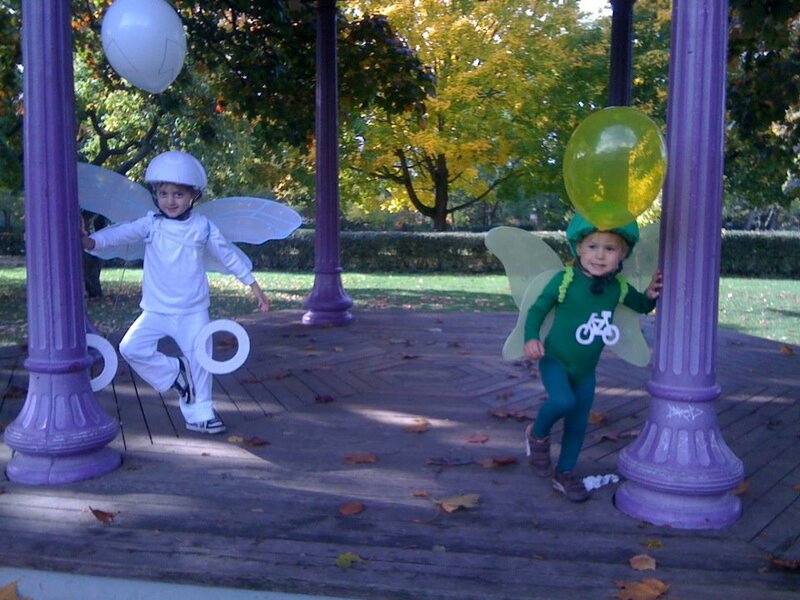 Eventually–like last year…no, like when he was five, maybe?–he demanded we use his given name. Unfortunately for me, he wanted to use the whole damn thing so I stumbled over Alexander for a while. I imagine we either stopped talking to one another or he came to his senses and conceded to be called Alex. For decades we’d see people we hadn’t see since we were little who’d address him as Brooker and I’d giggle while he muttered “It’s Alex now.” Poor kid. As always, stay tuned for the annual Big Dummy birthday post in early December in which I’ll recount the amazing things we’ve done over the past year so nothing of that nature right now. My celebration at the naming of my bike feels hollow knowing the life-saving Big Dummy of my friend Ginger was just stolen! The bike is registered with Bike Index and lots of eyes are looking for it, but add your eyes to the hunt and share the video, share the tweet, and register your own bike(s) on Bike Index RIGHT NOW if it’s not already in their database. The Roosevelt Paving & Safety Project is almost complete and it’s time to party! 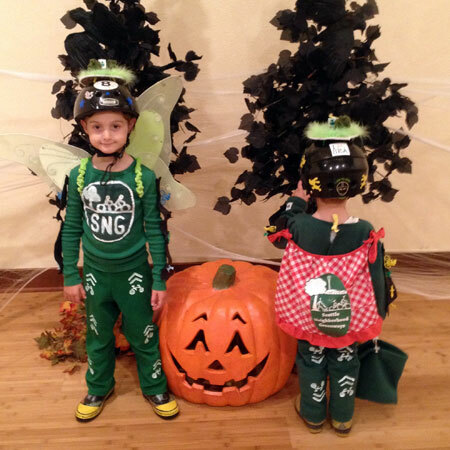 Join Familybike Seattle for a Kidical Mass ride to this special free event. 10:30 a.m. – meet at Mighty-O Donuts in Tangletown. We’ll have coffee and vegan doughnuts and can pop across the street to the 56th Street Market to purchase new, unused toiletries (toothbrushes, shampoo, soap, etc) for the donation drive at the University District Food Bank, now in its great new location. 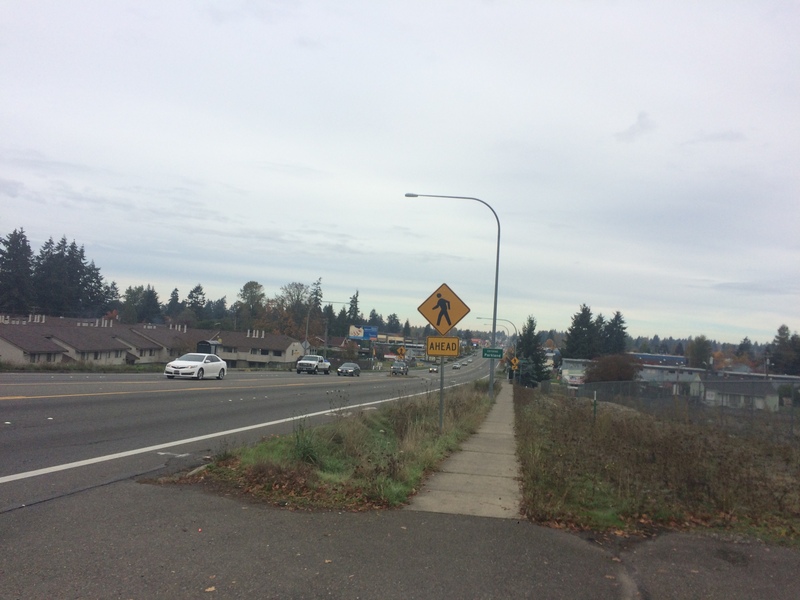 Our 2.3-mile route through Green Lake will feature quiet neighborhood streets, some of the Green Lake path, paint-separated bike lanes, and finally the new protected bike lane on Roosevelt! Noon – Ribbon cutting with Seattle Neighborhood Greenways at the University District Food Bank. 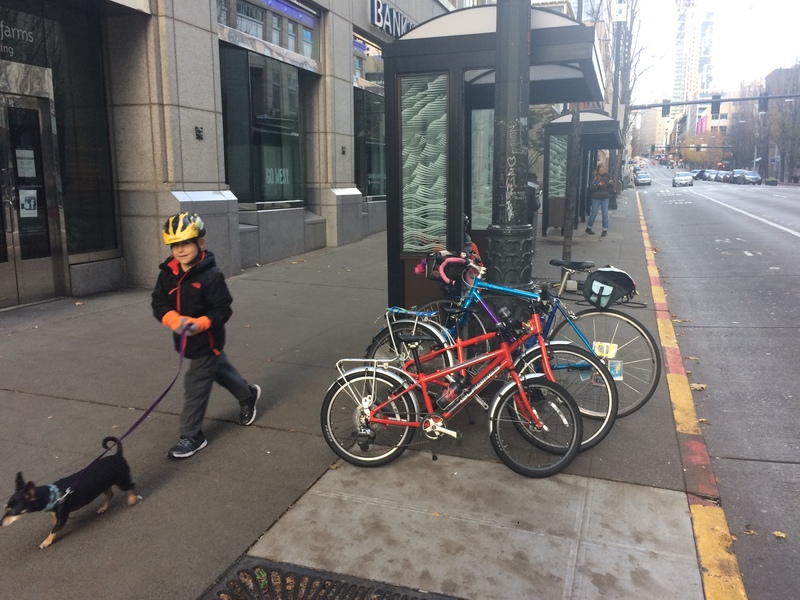 Kids and families will ceremonially ride onto the new Roosevelt Protected Bike Lane. 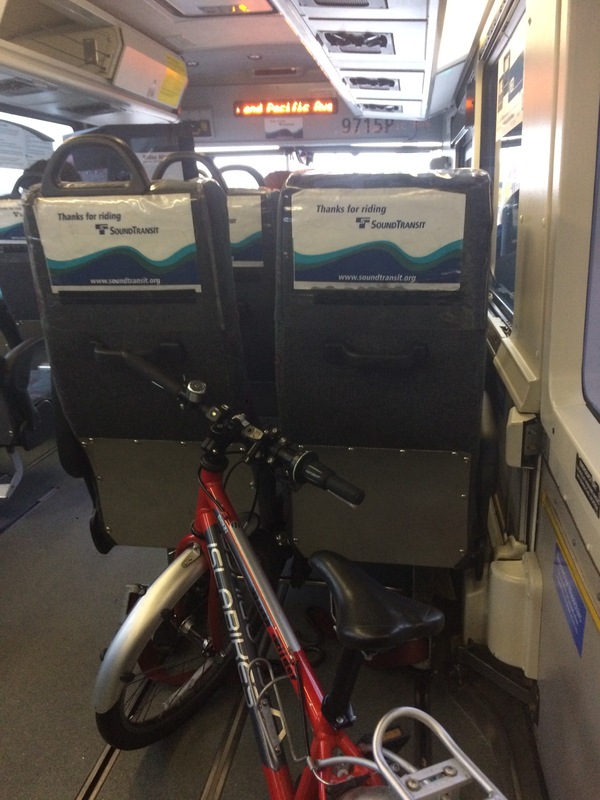 Transportation resource fair (SDOT resources, ORCA, Pronto, Vision Zero, etc. ), activities, and food drive at the food bank. Community passport: visit participating Roosevelt businesses and collect stickers. Completed passports entered into a drawing to win prizes. 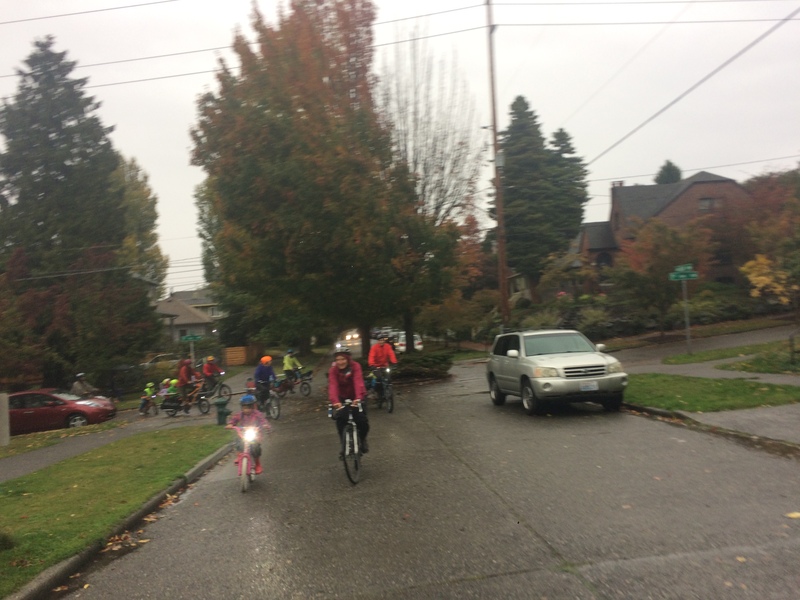 Hooray for hearty Seattle family bikers who came out for Kidical Mass rides to Swansons for pumpkins and baby goats! despite every Seattleite being extremely worried by the SUPER STORM forecast. A large group–17!!! 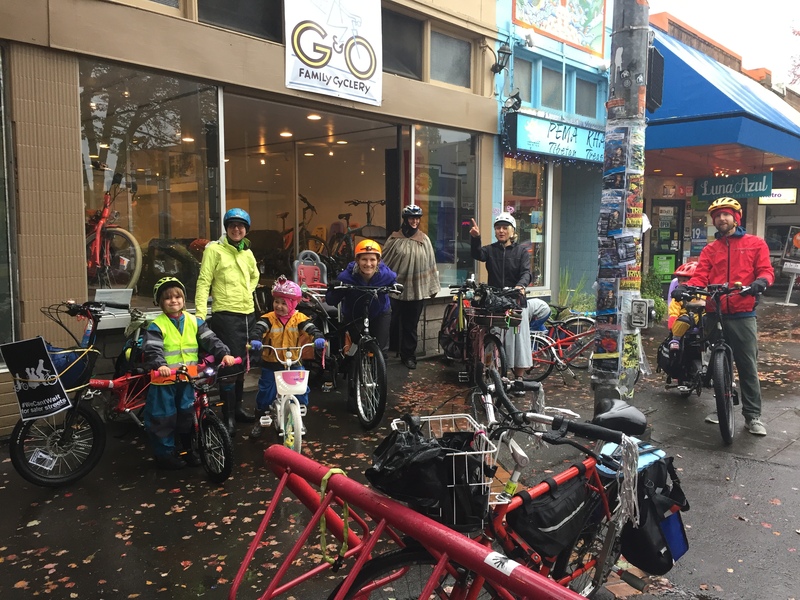 !–gathered at G&O Family Cyclery for free espresso (thanks!!) while the kids played in the awesome toy corner. We had light rain the whole time, but only felt a bit of wind as we turned the last corner to the nursery. 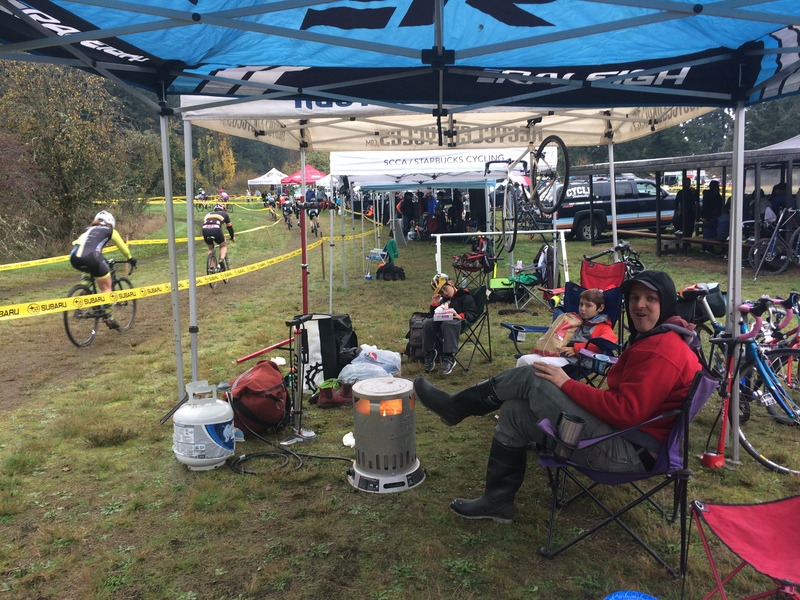 It was a great opportunity to test rain gear for many of us. I was OK in rain jacket, rain skirt, shoe covers, and no gloves (though I brought two pairs just in case). My kids wore rain jackets and rain pants, but really wanted to wear regular shoes instead of boots so they ended up with wet feet. 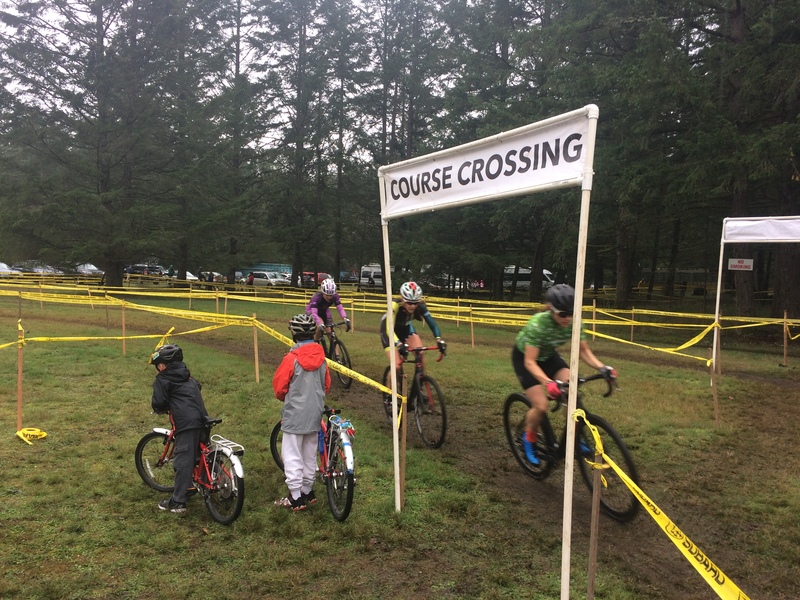 My older kid pedaled and was OK, even without gloves (he finds it easier to shift without them), but I carried my younger kid due to an upset stomach and his feet were pretty uncomfortable. As were his hands, wet despite his gloves. 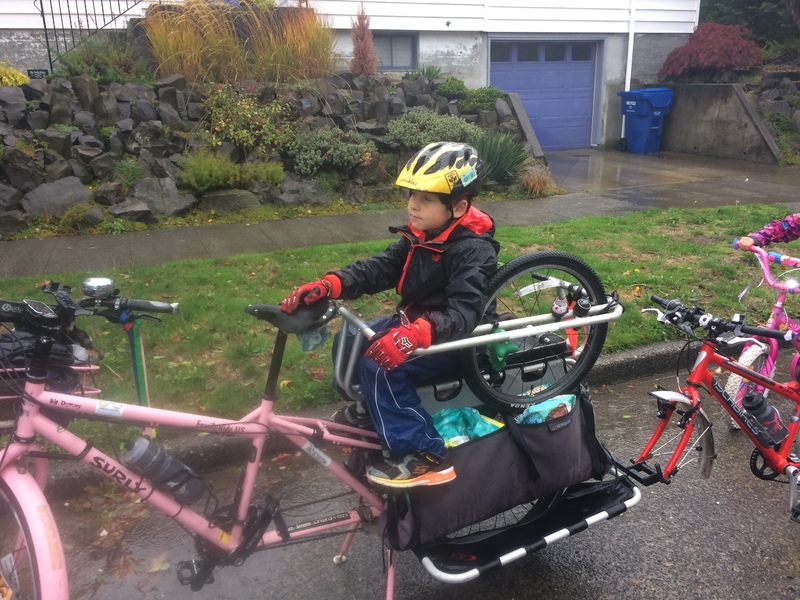 We have two sets of handlebar mittens–one Bar Mitts and one Portland Pogies–and I love them and recommend them to adults all the time (and Bar Mitts Stroller Mitts for Xtracycle Hooptie/Yuba Monkeybars/Haul-a-Day Whoopee-Deux rails), but my kids aren’t used to shifting with them yet. This is reason enough to take the tandem + trailer bike on our next cold ride. Swansons was great! The goats were adorable! With awesome names: Buttermilk Pancake, MegaMan, and Tootsie Roll. 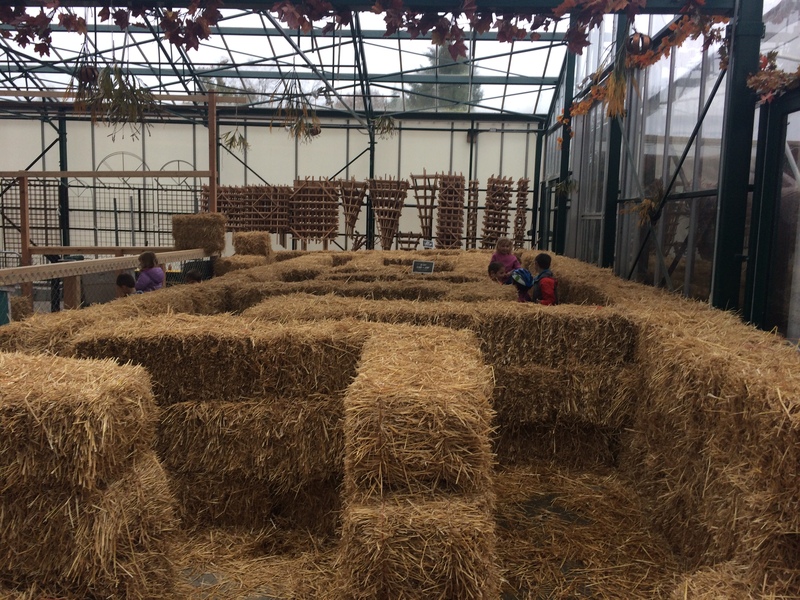 And the kids enjoyed the hay maze and peeked at the partially-assembled holiday model train display (I hear it’s going to be a cross between Halloweentown and Whoville this year). Unfortunately, the day didn’t go quite as planned–Swansons warned us they needed to close early, at 2pm, due to the impending wind storm, but our end spot, Flying Bike Cooperative Brewery was closed until 3pm for a special event. 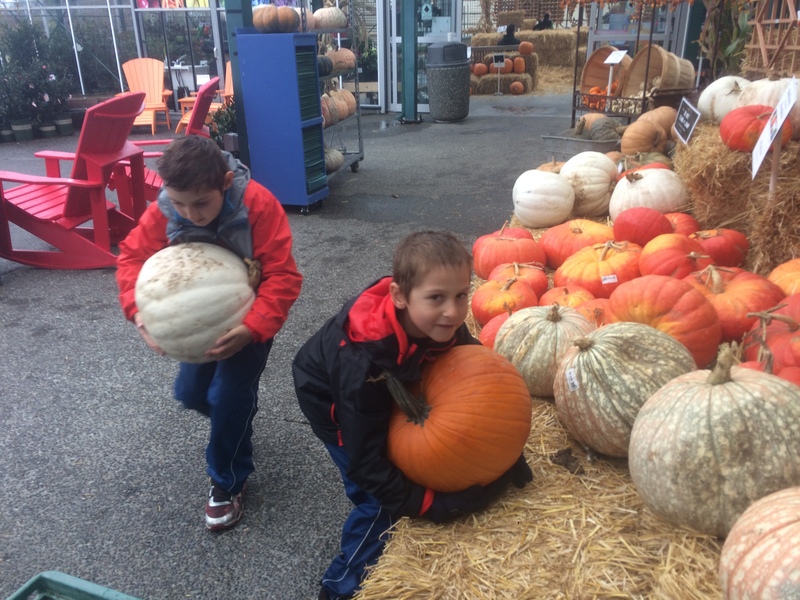 That didn’t really matter for my family, though, because my kid with the upset stomach vomited by the pumpkins so we headed for home as soon as we could. But we got our pumpkins! We agreed ahead of time on each kid selecting one big pumpkin, one medium pumpkin, and two mini pumpkins. 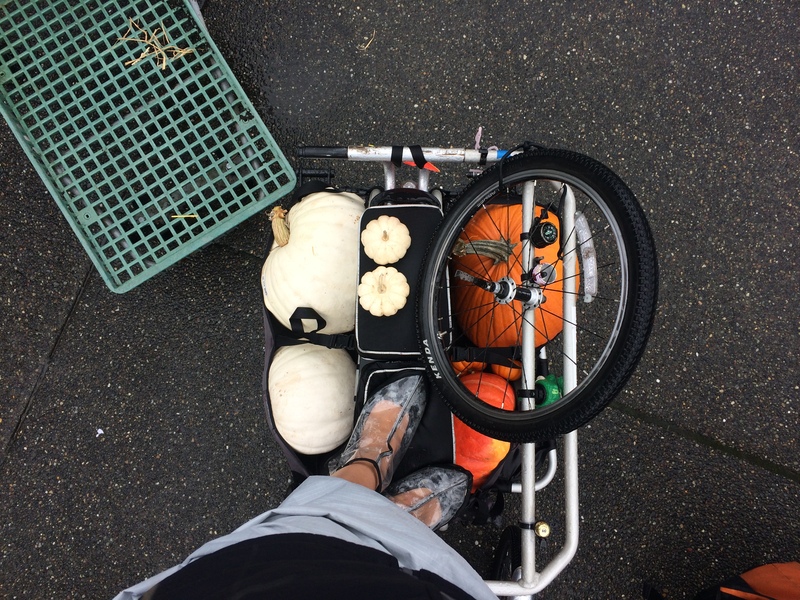 One kid wanted all ghost pumpkins so we ended up with a cool-looking bike load. 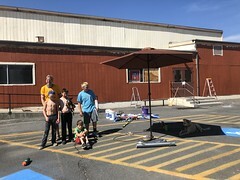 A few families coordinated drying off at a nearby house together so I’m relieved an after-party/playdate still happened. 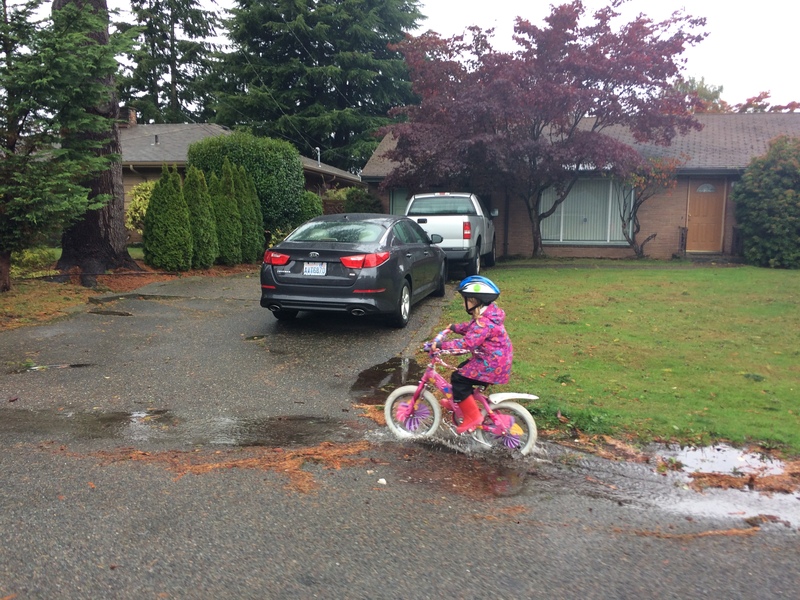 We biked off with one other family which was fun for our two puddle splashers (and their littler kid is the one who gave me a shell and told me I looked pretty during one camping trip so he’s my super duper favorite even though he doesn’t seem to remember our special moment). See all the photos by me and S J from G&O Family Cyclery in this Flickr album: 2016 Kidical Mass to Swansons Hay Maze – October 15, 2016 – 70 photos.